Social business is about much more than social media. A social business is an organisation whose culture and practices encourage networks of people—employees, partners, customers and others—to create business value, and, ultimately, increase revenue and profits. So who are the exceptional talents building today’s social businesses and what can we learn from them? 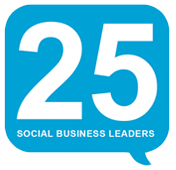 The Economist Intelligence Unit (EIU) has identified 25 leaders who are successfully applying social technologies, principles and strategies within organisations around the world. It’s a fascinating list, and there are definitely stories here that will be relevant to all sizes and types of organisations. Confused by your ‘as a Service’ options?